Wonderful visit to Photo London 2018 at Somerset House. I discovered a whole range of photographers, some familiar including the black and white image by world renowned Brazilian photographer Sebastian Salgado above. This beautiful visual representation of a simply dressed, seated Dinka girl in Southern Sudan (1976) highlights a strong connection with Dinka cattle, as the horns have literally been sculpted into the earthern walls of this traditional adobe architecture. 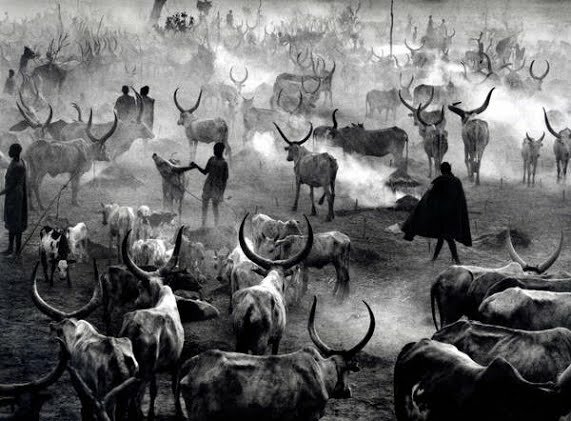 I feel Salgado has captured a simplicity in this image between the girl, chair and house you can almost touch, which highlights the simple but important symbolic connection between the Dinka, domesticity and the landscape. For further info on Salgado do read an earlier blog post I wrote. In stark contrast however, I also wanted to briefly share my anthropological thoughts about an alternative concept of the emotional essence of space and place through the equally famous, but controversial work of the American photographer Roger Ballen. Marginalised South African communities representing Insiders and Outsiders. Windowless architectural spaces, dirt, walls and floors covered in graffiti, marks, lines and traces. Domesticated and undomesticated animals, cats, dogs, pigs, sheep, snakes. Broken and found objects and wire. I feel Ballen’s images are so disturbingly haunting they sit in their own psychological, subconscious space. Chaos over confusion, madness over reality- which is how he likes it. If you are curious and want to step into Ballen’s world (hmmm), click on the links below. I would be interested to know your thoughts!